Paleontology, palaeontology or palæontology (from Greek: paleo, "ancient"; ontos, "being"; and logos, "knowledge") is the study of prehistoric life forms on Earth through the examination of plant and animal fossils. This includes the study of body fossils, tracks (ichnites), burrows, cast-off parts, fossilised faeces (coprolites), palynomorphs and chemical residues. Because mankind has encountered fossils for millennia, paleontology has a long history both before and after becoming formalized as a science. This article records significant discoveries and events related to paleontology that occurred in the year 1978. Wikimedia Commons has media related to 1978 in paleontology. A paleoanthropological team led by Mary Leakey found 3.5 million year old human footprints. Baby hadrosaurs were discovered in the Two Medicine Formation. Maurits Lindström, described the earliest known octocoral in Sweden shifting the first known appearance from the Cretaceous to the Ordovician. PReoccupied by Blake 1863. Renamed Coloradisaurus. Lesothosaurus Valid taxon Possible junior synonym of Fabrosaurus. The Longest Name for a Dinosaur. 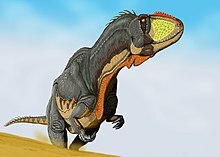 "Roccosaurus" Nomen nudum. Junior synonym of Melanorosaurus. A Giant Meat-Eating Dinosaur from China. A Phasianidae.The taxonomic status of this species should be reevaluated. There is no evidence, that it belongs to the genus Gallus Brisson. A Phalacrocoracidae, transferred to the genus Nectornis Cheneval, 1984 by Mlíkovský, 1998. A Recurvirostridae, most unlikely it is a Recurvirostra or even a Recurvirostridae. Dinosaur Planet by Anne McAffrey was published. This novel was about a planet called Ireta that was populated by dinosaurs transplanted there by aliens attempting to preserve Earth's Mesozoic biosphere. Paleontologist William A. S. Sarjeant has praised the intelligent pterosaurs descended from Quetzalcoatlus in the novel as plausible. ^ Newman, Garfield; et al. (2001). Echoes from the past: world history to the 16th century. Toronto: McGraw-Hill Ryerson Ltd. ISBN 978-0-07-088739-8. ^ Trexler, D., 2001, Two Medicine Formation, Montana: geology and fauna: In: Mesozoic Vertebrate Life, edited by Tanke, D. H., and Carpenter, K., Indiana University Press, pp. 298–309. ^ Kurzanov, S.M. and T.A. Tumanova. 1978. On the structure of the endocranium in some anylosaurs from Mongolia [in Russian]. Paleontol. Zh. 1978: pp. 90-96. ^ Bonaparte, J.F. 1978. Coloradia brevis n. gen. et. n. sp. (Saurischia, Prosauropoda), dinosaurio Plateosauridae de la Formacion Los Colorados Triasico superior de La Rioja, Argentina. Ameghiniana 15: pp. 327-332. ^ Galton, P.M. 1978. Fabrosauridae, the basal family of ornithischian dinosaurs (Reptilia: Ornithopoda). Paläont. Z. 52 (1/2): pp. 138-159. ^ Dong, Z. 1978. A new genus of Pachycephalosauria from Laiyang, Shantung. Vertebrata PalAsiatica 16: pp. 225-228. ^ Wild, R. 1978. Ein Sauropoden-Rest (Reptilia, Saurischia) aus dem Posidonienschiefer (Lias, Toarcium) von Holzmaden. Stuttgarter Beitrage zur Naturkunde, Serie B (Geologie und Paleontologie) 41: pp. 1-15. ^ van Heerden vide Anderson, J. M., and A.R.I. Cruickshank. 1978. The biostratigraphy of the Permian and the Triassic. Part 5. A review of the classification and distribution of Permo-Triassic tetrapods. Palaeontographica Africana 21: pp. 15- 44. ^ Sues, H -D. 1978. A new small theropod dinosaur from the Judith River Formation (Campanian) of Alberta, Canada. Zool. J. Linn. Soc. London 62: pp. 381-400. ^ Dong, Z., Y. Chang, X. Li, and S. Zhou. 1978. Note on a new carnosaur (Yangchuanosaurus shangyouensis gen. et sp. nov.) from the Jurassic of Yangchuan District, Szechuan Province. Kexue Tongbao 23: pp. 298-302. ^ a b Colin J. O. Harrison & Cyril A. Walker (1978). "Pleistocene Bird Remains from Aldabra Atoll Indian Ocean". Journal of Natural History. 12 (1): 7–14. doi:10.1080/00222937800770021a. ^ Nikolaj I. Burchak-Abramovich & D. V. Gadzyev (1978). "Anser eldaricus sp. nova from Upper Sarmatian Hipparion Fauna of Eldar". Acta Zoologica Cracoviensia. 23: 67–78. ^ a b c d Dénes Jánossy (1978). "Plio-Pleistocene Bird Remains from the Carpathian Basin. III. Strigiformes, Falconiformes, Caprimulgiformes, Apodiformes". Aquila. 84: 9–36. ^ Colin J. O. Harrison (1978). "A New Jungle-Fowl from the Pleistocene of Europe". Journal of Archaeological Science London. 290 (4): 1–26. doi:10.1016/0305-4403(78)90056-0. ^ a b c Hildegarde Howard (1978). "Late Miocene Marine Birds from Orange County, California" (PDF). Museum of Natural History of Los Angeles County, Contributions in Science. 290: 1–26. ^ Cécile Mourer-Chauviré (1978). "Oiseaux. Pg. 52-54 In: Jean Claude Paicheler, France de Broin, Jean Gaudant, Cécile Mourer-Chauviré, Jean Claude Rage & Colette Vergnoud-Crazzini, 1978: Le Basin Lacustre Miocène de Bes-Konak (Anatolie-Turquie): Gélogie et Introduction à la Paléontologie des Vertébrés". Géobios. 11 (1): 43–65. doi:10.1080/00222937800770021a. ^ Jirí Mlíkovský (1978). "Early Miocene Birds of Břešt'any, Czech Republic" (PDF). Casopis Narodniho Muzea, Rada Prirodovedna. 167: 99–101. ^ Cécile Mourer-Chauviré (1978). "La Poche à Phosphate de Ste. Neboule (Lot) et sa Faune de Vertébrès du Ludien Supérieur. 6. Oiseaux". Palaeovertebrata. 8: 217–229. ^ Sarjeant, W. A. S., 2001, Dinosaurs in fiction: In: Mesozoic Vertebrate Life, edited by Tanke, D. H., and Carpenter, K., Indiana University Press, p. 504-529.